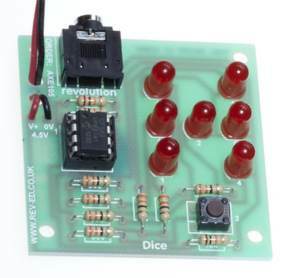 This project uses an 8-pin microcontroller to produce a tumbling dice via red LEDs. 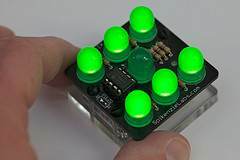 There are lots of DICE projects on the web and many of them are copies of our original LED Dice with slowdown. 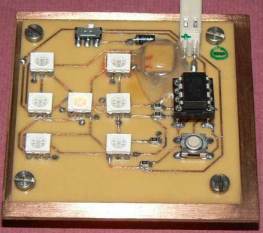 The circuit and layout has been copied by many websites and it is pleasing to know that thousands of hobbyists have built our circuit and enjoyed its features. 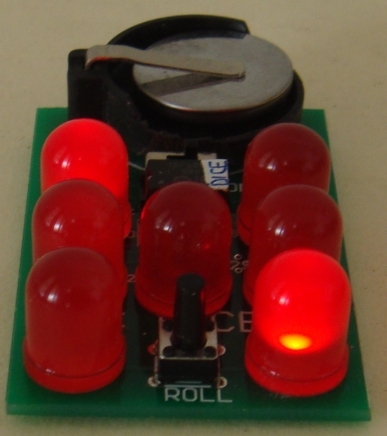 We now show how the same effect can be produced with a microcontroller and a few resistors. 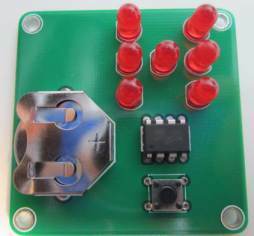 The circuit is simpler, the board is smaller and the project costs less than the original design. That's the advantage of the microcontroller. This project is parts of a course where we show how to design around a microcontroller because this is the way of the future. Once you collect the equipment necessary to burn the microcontroller, and set-up your computer with NotePad2, to write the programs you will have 2 separate areas in your work-room. One area will consists of a soldering iron, components and experimenter boards, where you design and develop the project. The other area will consist of a computer with NotePad2, where you write the program using mnemonics (short sentences) and compile it with MPASM to produce a .asm file as well as a .hex file. The .hex file will then be used by WinPIC to burn the micro (program the micro). 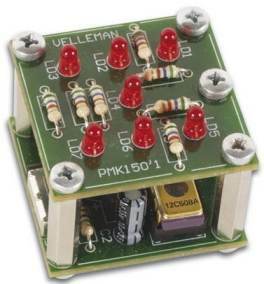 Take the micro from the programming socket on PIC Programmer MkIV, insert it into the project and view the results. This is just like designing and producing your own chip. is tapped to change the LEDs. It is a $20.00 soldering project. does not teach any electronics. but you are not "PIC programming." 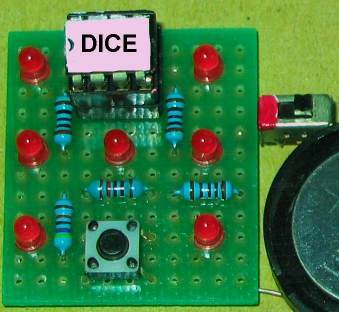 A LED Dice project constructed on Matrix Board. Only the .hex file is provided. 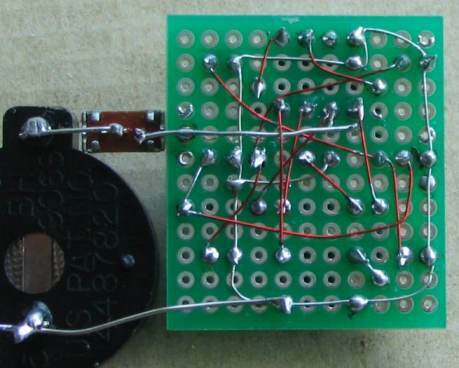 This project uses ATTiny-13 micro. The PC board should have current-limiting resistors. The display does not have a "rolling Dice" effect. A nice layout showing how to add surface-mount components. but the remainder of the article cannot be located. 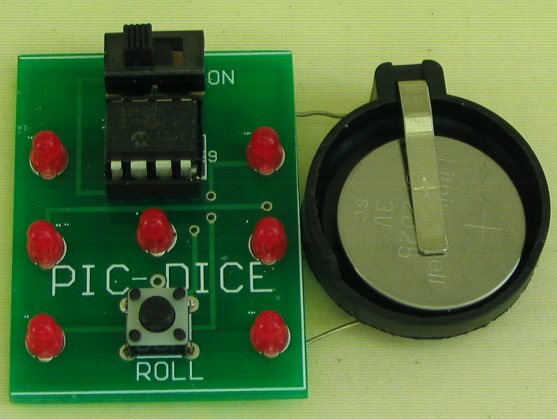 None of the Dice projects on the web teach how to create a program and they are simply soldering exercises. Ours is an EDUCATIONAL PROJECT. We explain every instruction in the program so you can use them in the next project you are developing. Let’s settle an argument before it starts. Die or Dice? Sure, the Oxford Dictionary would have us say one die, two dice. But every man and his dog uses the word "dice" for both singular and plural. So we’ll stick with dice. Using a PIC allows us to significantly simplify our dice circuit. Previous designs have typically used at least two ICs, four or more transistors and many resistors and capacitors. This project an ideal way for a beginner in micros to get a grasp of the fundamentals. The 8-pin PIC micro we are using has 6 input-output lines and one line that is INPUT-ONLY. We will use the input line for the switch and 4 of the other lines as OUTPUTS. Each output line can deliver 25mA. This limitation is due to the FET transistors inside the the chip. Obviously they are microscopic and 25mA is a great achievement. Many of the other microcontrollers can only deliver 20mA per drive-line. Drive Current is the current delivered to each LED to make it illuminate. There is a very wide range of LEDs on the market, from surface-mount, to 3mm to 5mm and they range from very poor quality to bright, high-bright and super bright. Some LEDs require 20mA to produce good illumination while others produce a very good output with as little as 2 to 5mA. On top of this, different colour LEDs have a different characteristic voltage-drop across them when illuminated and all these factors have to be taken into account when determining the value of the current-limiting resistor for each output. One output has a single LED while the other outputs have two LEDs in series. The value of dropper resistor for the single LED can range from R for a red LED requiring 5mA, to R for an orange LED requiring 20mA. We have selected 68R for the 2 LEDs in series to provide about 10mA and 82R for the single LED to provide about 20mA. Look at the illumination; decide which value is most suitable and adjust the current accordingly. 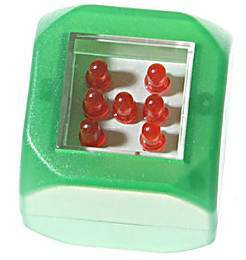 Red LEDs drop about 1.7v when illuminated, orange LEDs about 2v, and green LEDs about 2.3v. This value does not change if the LED is surface-mount or 5mm, but it does change slightly when the current is increased. This project is very simple because all the features are contained in the microcontroller in the form of a program. Instead of a two chips and a lot of surrounding timing components, as in previous LED Dice projects, we have a single chip driving the 7 LEDs and a few current limiting resistors. You can approach this project in several different ways at different levels. You can simply buy a kit and put it together. 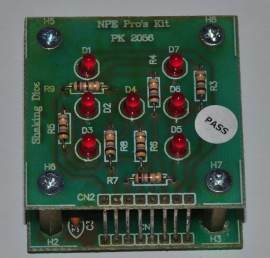 Or you can buy the components from your local electronics store and burn the program into the micro using PIC Programmer MkIV project and the .hex file provided. All these levels are available because we have provided the full program listing plus hardware and software to get you into PIC Programming at the lowest cost. The circuit is very simple. It just consists of a micro, 7 LEDs, resistors and a "roll" switch. The only components that may have to be adjusted are the current-limiting resistors, to get the desired brightness. We have suggested values for super-bright red LEDs, but if you want to use other colours you may have to decease the values slightly. For white LEDs, the supply voltage will have to be increase to at least 4.5v. This modification is covered in the article on the web. 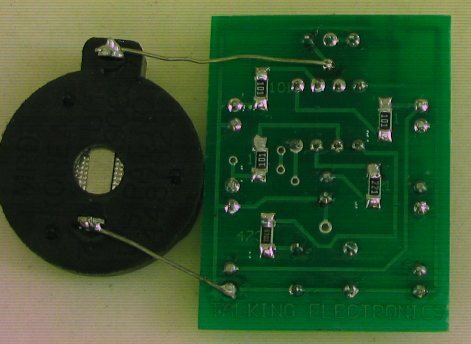 You can build this project as a soldering exercise or go further and investigate the program and change some of the instructions to produce different “rolling” effects. The PIC Dice project constructed on Matrix Board. The underside of the board showing the "point-to-point" wiring. 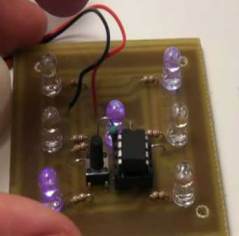 When the circuit is switched on, the tactile switch is pressed and the LEDs flash to represent the rolling of the dice. Jumbo RED LEDs for $2.50 extra. Ask for them when ordering. The PC board is also larger. ;increases Random very quickly until the switch is released. btfss	03,0	    ;test the Carry. movlw	b'00001000' 	;must clear the GPIF flag! !